I am always creating new classes, workshops and retreats, but here is a list of my more popular ones. All classes and workshops can be tailored so that they fit the demographics of your group. CREATIVITY RETREAT Imagine a retreat that allows you to rest, relax and rejuvenate....and also gives you the tools to create the best life ever! This isn't about artistic creativity. It is about creating a life that works for you. I offer this retreat in various places and at various times of the year, and I also do this retreat for business and spiritual groups. Contact me if you want a proposal to do this retreat for your group! The 4th annual 2019 Death Valley Creativity Retreat will be held in March, stay tuned for more news! STATUS QUO OR STATUS GO! Are you stuck in a rut? Have you furnished that rut? I can identify! 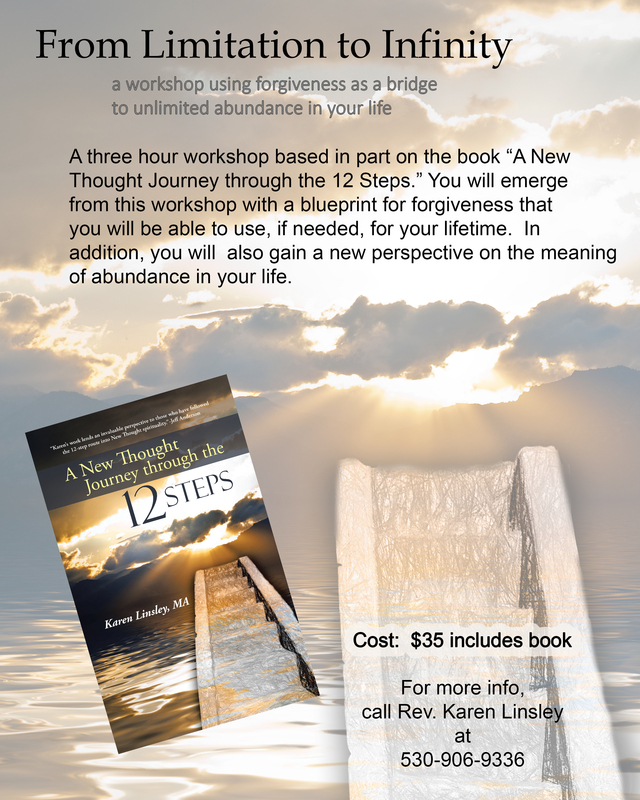 Learn the tools necessary to never be stuck again in this 3 hour workshop. DO WHAT YOU LOVE FOR A LIVING Do you think life is supposed to be about showing up to your 9-5 job so you can earn money to buy things you don't really want and take weekends off to relieve the pressure? I happen to think life is much much more than that. Let's face it, we all have to earn a living. In this 3-hour workshop, get the skills and knowhow necessary to allow you to do what you love for a living! 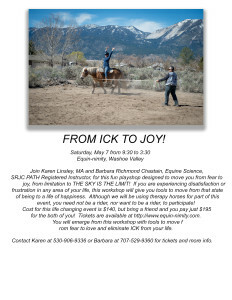 From ICK to Joy! 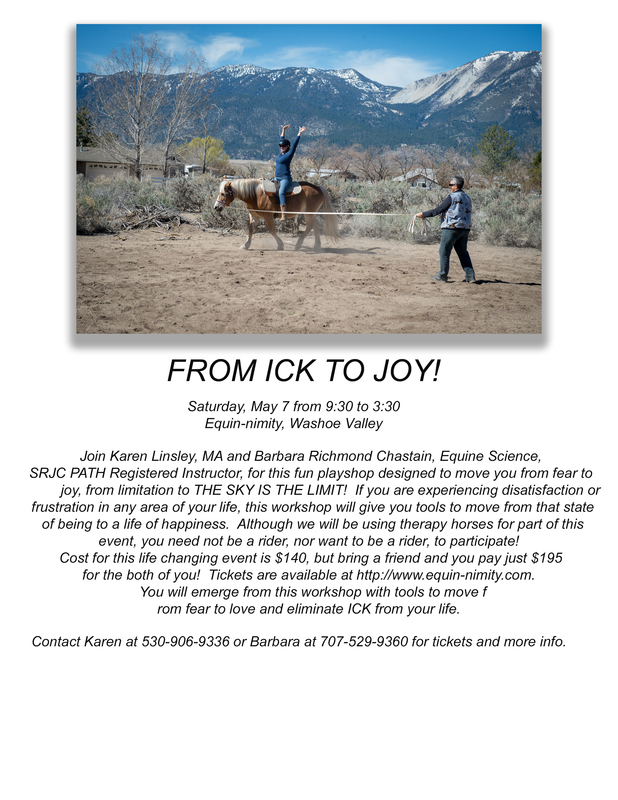 A full day workshop using therapy animals, usually done in the spring! From Limitation to Infinity! 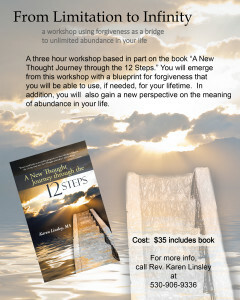 A three hour workshop based on my book A New Thought Journey through the 12 Steps. Meditation is one of most powerful things we can do in our lives to ensure peace of mind and happiness. It also strengthens the immune system, lowers blood pressure and helps provide clarity. Yet, many people get stuck with meditation. The most common objections I hear from people are: "I can't clear my mind." "I can't sit still for that long." And..."I don't have time." Meditation isn't about clearing the mind, it is about focus. It becomes easy to sit if you start in small increments and focus. And once you begin to sit regularly and focus, you will begin to receive the benefits of meditation and realize that taking time to meditate means your time the rest of the day is used more successfully. This is a full day workshop that presents several different ways to meditate, so you can find the one that suits you best. This 3 hour workshop is also about self care, and is designed primarily for entrepreneurs, although care givers have gained great benefits from taking this workshop. Creativity and Spirituality: Get your creative on in this 10 week class! Self Mastery, a ten week class based on The Four Agreements..
Karen Linsley is a sought after inspirational speaker, having spoken at Centers for Spiritual Living thoughout California and Nevada. She also speaks at service clubs and business organizations.